The handrail selection process is one that involves determining what shape, size, and species of wood you want in your house or commercial building. Whether you want to match existing woods in your home, or go with a completely new look to accent a particular style you have in mind, LAJ Wood Products can meet your stair part needs. Prior to making a purchase, make sure your handrail profile is allowed in your city. Not every single handrail offered may meet your city’s building code. Some handrails may be too wide – others too tall. Before buying your handrail, research your city’s building codes, so that your staircase is within the allowed size. Now that you’ve selected which profile of handrail you want to go with, you should decide if you need to “plow” your handrail, which depends on which kind of baluster you want for your stairs. “Plowing” your handrail means a rectangular portion of the handrail is cut off from the bottom to create a space for the square balusters. If your baluster selection is a square-top, you will need to have the underside of your handrail plowed in order to create space for the handrail to sit on top of the balusters. Just as the handrail is meant to rest on top of your balusters, the shoe rail is designed for the bottom of your balusters. Any square balusters in your stair system will require your shoe rail to be plowed. Plowed shoe rails serve the same purpose as plowed handrails: to secure your square baluster in place. 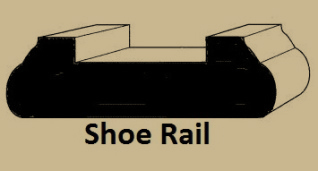 And just as fillet is used to fill in the spacing underneath the plowed handrails, it is also used to fill in the space left behind by the balusters on top of the shoe rail. Bending handrails are for curved or spiral stair cases. These special handrails are cut into narrow slits of wood (glue to be applied in between) so that the wood can be molded into the desired curved shape. Our handrails at LAJ Wood Products are all made of the highest quality woods, and are offered at reasonable pricing. Whether you need a straight, plowed, or bending handrail, LAJ can help you finish that staircase you’ve always dreamed of. If you have any questions or concerns regarding handrails or any kind of wood products, feel free to call LAJ Wood Products: (510) 489 8353. Our store hours are Monday – Friday, from 8 AM – 4 PM (Pacific Standard Time).